Boston Handmade: The Art of the "Staycation"
The Art of the "Staycation"
With gas prices continuing to soar with no apparent end in sight, many people (including myself) are reorganizing their summer plans to include more day trips. With this in mind, I've been trying to come up with some ideas other than the usual day trip to the beach and the zoo (although those will definitely be visited quite frequently). Our area has a wealth of things to do for people of all ages. 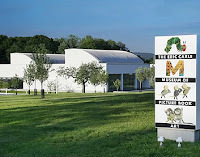 One place I am looking forward to visiting is the Eric Carle Museum of Picture Book Art in Amherst, MA. Founded in part by Eric Carle, the renowned author and illustrator of more than 70 books, including the 1969 classic The Very Hungry Caterpillar, The Eric Carle Museum of Picture Book Art is a full-scale museum devoted to national and international picture book art, conceived and built with the aim of celebrating the art that we are first exposed to as children. Join The Carle for a day of family fun in Celebration of Eric Carle's June Birthday. From 11:00 am and 2:00 pm rock into summer reading with The Cat's Pajamas. Their musical celebration of books will have you dancing in the aisles! Artist demonstrations and special storytimes throughout the day with Diane deGroat, David Milgrim and more. So where are you planning on going this summer? whoa i think i definitely have to visit eric carles museum!